Check out our guide on what to do before launching a survey. To start setting up your first survey, navigate to the Admin Panel and click on Surveys from the left sidebar. From there, click the "Create survey" button on the top right. The first step (and one of the most important parts) of the engagement survey process is deciding which questions you're going to ask. Lattice Surveys comes with a question bank developed in partnership with the University of California, Berkeley Social Sciences Department. These questions would work well in any organization looking to run a general engagement survey. If you wish, you can also add your own custom questions to the survey. Give your survey a name that's specific so that down the line, you can easily find it again. We recommend having the type of survey and the date in the name, for example: Employee Engagement, July 2018. Employees that are survey admins can configure survey settings and have full access to the anonymized results. You can set admins on a per survey basis. This means that any employee can be an admin of a survey without having administrative access to other parts of Lattice (reviews, private feedback, etc). You can come back to this step even after your survey has launched to add or remove any survey admins. This is the date communicated to survey participants on when the survey will end. The survey will not automatically be closed on this date, but both admins and survey participants who have not submitted their survey will be sent a reminder two days before this end date. We recommend setting an end date a couple of days before when you actually want the survey to end. You can also come back and change this date after your survey launches. Choose who you want to fill out your survey. We recommend selecting everyone in your company, but you can also choose based off of departments or reporting relationships. Alternatively, you can also upload a CSV with who you want involved in the survey. You can see what a launch email might look like here. After you launch the survey, the survey will immediately start collecting responses. 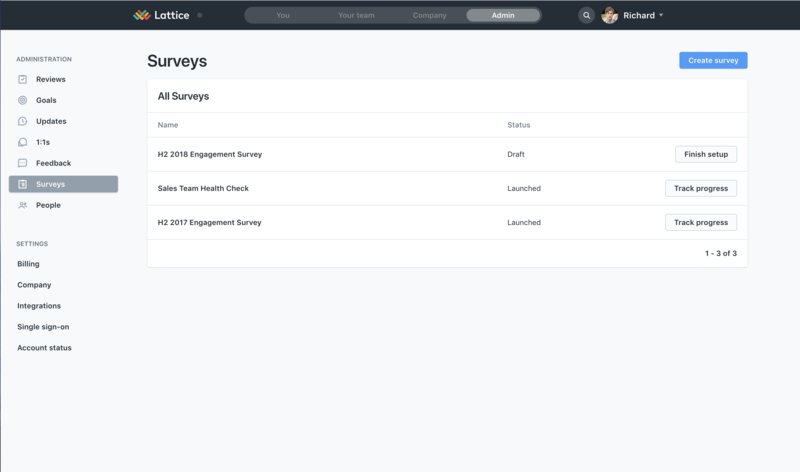 If you chose to send a launch email through Lattice, we will also include a link to all responders to the survey form, as well create a task for them on the user's homepage. If you choose to skip sending the email through Lattice, users will still get a task in Lattice linking them to the survey. We recommend leaving the survey open for 2 weeks. This gives people enough of a chance to fill it out, but does not drag on the process longer than it needs to be. Be sure to send reminders to participants while the survey is open. Lattice will automatically send an email reminder to everyone who has not yet completed the survey two days before the end date, but you can also manually trigger reminders from the Participation tab. Keep the survey shorter rather than longer. If you're sending out a yearly or twice a year survey, keep survey length below 50 questions to reduce fatigue. For more frequent surveys, they should be even shorter. In your launch email, be sure to communicate that survey responses will not be associated with an individual employee, and that results will only be analyzed on an aggregate basis.